Most Recent Subscribers - Welcome! Spam starts when you register online. Internet sites big and small send you email you don't want to receive. They sell your address to email marketing firms. And you get bombarded with email. Lots of email. We give you an unlimited number of disposable (proxy) email addresses you can create on-the-fly so that noone ever needs to know your real email address. Best yet, you can continue to use your existing email account and email client. 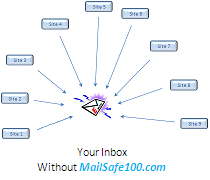 We simply let you control what email you receive and what email you do not. And this control lets you stop all spam today. We make sure no spammer learns your real email address! 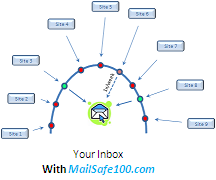 With MailSafe100.com registration, you will feel 100% safe to enter your email address on any online or offline form, large site, small site, reputable site, or a little unknown startup. How do we do it? ............... Read More!